REDUCE the number of years you have to work FERS to be eligible for retirement. 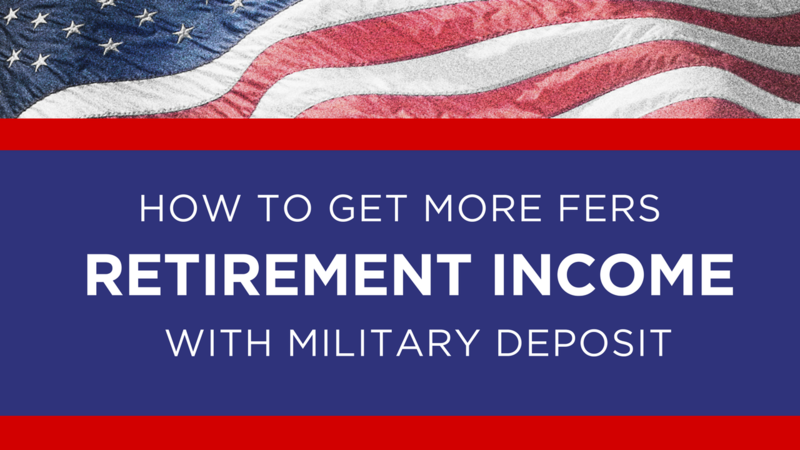 There’s a provision in FERS that allows you to make a deposit, or “buy back”, your active duty military service—and that time will count as creditable service for FERS retirement. Creditable service is important because it’s used to figure out when you can retire with a FERS pension AND how much your monthly pension will be! This can really add up to a tidy sum in retirement! In this example below, "buying back" active duty military service added $72,000 more to the lifetime value of FERS. The cost of your FERS military service deposit is calculated based on 3% of your basic pay you earned while in the military plus interest. However, if you pay your deposit within the first two years as a FERS employee, you will not owe any interest on the deposit amount. If you’re past the two-year employee mark, it’s a good idea to get started right away because interest on the deposit is continuing to build each day you delay it! SO, HOW MUCH MORE DO I GET IN RETIREMENT? Basically, for each year of military service you “buy back,” your pension will increase by 1% of your highest average earnings under FERS—and even more if you are at least 62 with 20 years of service at retirement (1.1%). This can really add up over the years in retirement! WHO IS ELIGIBLE TO MAKE A DEPOSIT? Current FERS employees who have active-duty military service with honorable discharge—including reservists with active duty periods. CAUTION IF YOU'RE AN ACTIVE DUTY RETIREE! However, Reservist retirements are NOT affected by this rule. This is a three-step process. First, you’ll need to gather earnings documentation from each branch of service. Next, you’ll submit the earnings documentation to your human resource office to calculate the deposit amount. Finally, you'll make a decision if you wish to make a deposit. Complete a separate Estimated Earning During Military Service Request Form (RI 20-97) for each branch of service. Attach your DD214 (or equivalent) and send to appropriate military finance center. Upon receipt of your estimated military earnings from the Military Finance Center, complete Application to Make Service Credit Payment (SF 3108). Return all documentation to your human resource office. They can assist you with any questions. Your human resource office will calculate the cost of the deposit. You will receive a Military Service Deposit Estimate. You can then decide if you want to make the deposit with a one-time lump sum payment, or have automatic deductions from your pay each pay period. You are not required to make any deposit, it’s your choice. If you decide to “buy back” your military service for FERS, it’s vital that you KEEP all documentation! You’ll receive a final proof of payment once you have completed all payments. This is your proof that you have made the deposit. Keep it in a safe place!! 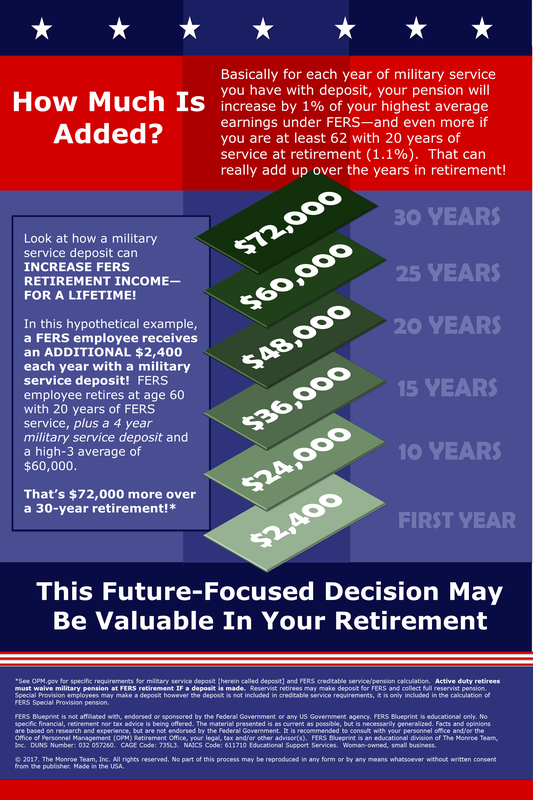 USING YOUR MILITARY SERVICE TO MAKE THE BEST OF YOUR FERS RETIREMENT! “Buying back” your active duty military service can be advantageous because those years, months and days of service are added to your FERS service. 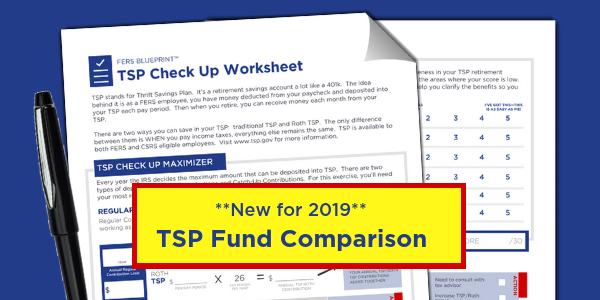 This can help you get more money each month in retirement and may reduce the number of years you must work under FERS to be eligible for retirement.